Boy I hope on some website somewhere Warner Bros reads about this brave kid. 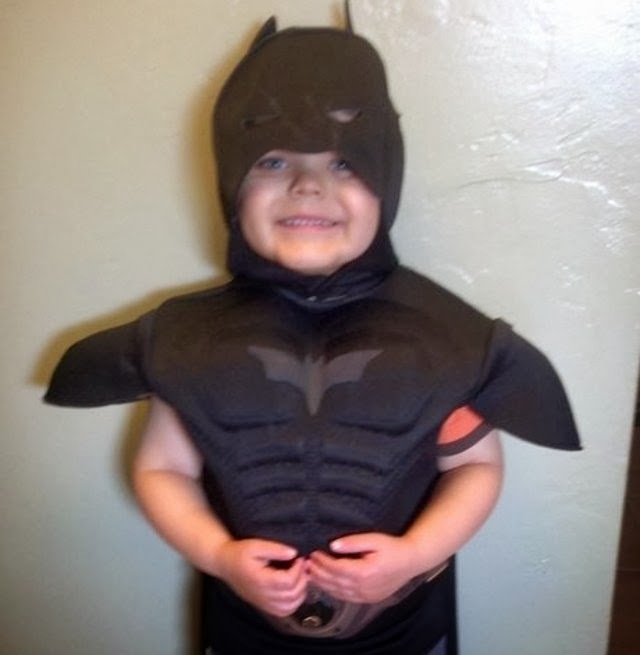 Five year old Miles is battling leukemia, and one of his inspirations in keeping up the good fight is Gotham's greatest - Batman. So when the Make-A-Wish Foundation came knocking to ask what Miles would like to do more than anything, his response was simple. He wants to be Batkid, and he wants to save Gotham. The day starts with a breaking news story. San Francisco's Police Chief asks if anyone knows the whereabouts of Batkid because he needs his help solving crime and bringing the bad guys to justice. Our little Batkid, Miles, in training with adult Batman, is ready to answer the call! Of course Batkid will be riding around the City, saving the day and performing feats of derring-do! After rescuing a damsel in distress from the Hyde St. cable car tracks in Nob Hill, and capturing the Puzzler in the act of robbing a downtown vault, Batkid will eat his lunch at the Burger Bar in San Francisco - directly above Union Square. While at Burger Bar, he will get a special message from the Chief of Police to go to the window - where he will look down and see a huge group of volunteers jumping up and down asking for Batkid's help. Why? Because the villainous Mr P will be kidnapping a famous San Francisco mascot! The getaway car will be visible on Union Square (a convertible so that everyone can see what is happening), and the chase will be on! After catching Mr P, Batkid will make his final stop at City Hall, where the Mayor and the Police Chief of San Francisco will thank him and give him the key to the city. If I was in San Francisco, I would so be there. This kid deserves all the support he can get, so if you know someone who can get along, please spread the word. Good luck Miles - we know you can win all battles set against you buddy! What do you think? For a full list of times and how you can play a part, click here. i checked out the schedule of this kid's adventure for the 15th. if i can go i'll bring my video camera. Please do Shlomo. This is an absolutely...I don't think I have words for it. I'm tearing up already. Go Batkid! Yeah, seriously, hopefully, since DC's moved/moving out to near that neck of the woods, plus the added press, they'll throw this poor kid a friggin' bone or something. This is awesome, when you read the schedule of Miles day on the Make-A-Wish link in the post, the team have really gone out of their way to make it a Batman adventure from start to finish - including burgers! It must be such a great opportunity to work in the MAW offices and bring deserving peoples dreams to light as a career. If Warners fronted with some Bat-props or even free comics that would really be a sweet move. If you do go Dave, definitely be interested in what you capture on camera mr. Here's hoping as many folks turn out as the timing allows.